The army has been put in charge of policing Rio. Chaos is come. Since 16 February an army general has been in charge of policing and security in the state of Rio de Janeiro. This is the effect of a surprise decree issued by President Michel Temer, since approved by both chambers of the Brazilian Congress. This is the first time since the end of the military dictatorship in 1985 that power has been transferred from civilian authorities to the military. In theory, the military ‘interventor’, General Walter Souza Braga Netto, is subordinate to the president, but there is little confidence that Temer will supervise the intervention to protect human rights. On the contrary, this is the government that last year changed the law to transfer jurisdiction over charges of abuses by the military from civil to military courts. In a parallel measure, Temer has created a new ministry of public security, and appointed to the post the former minister of defence, Raul Jungmann. Jungmann has proposed ‘collective warrants’, warrants that would allow the security forces to enter any number of premises in a given area. Such warrants have already been declared illegal in Brazil: to enter premises the security forces must have a warrant specifying an address and the name of the owner. ‘Collective warrants’ in effect criminalise poor communities. Jungmann’s replacement as minister of defence is an army general, a move that further expands the role of the military within government. Finally, the head of the army, General Eduardo Dias da Costa Villas Bôas, expressed concern that the intervention would lead to another Truth Commission, the investigation set up by President Dilma Rousseff, to investigate torture and other abuses committed by the military during the dictatorship. Criticism of the Truth Commission, and resistance to any restriction on the actions of the army, have become a theme in statements by senior army figures in recent weeks. 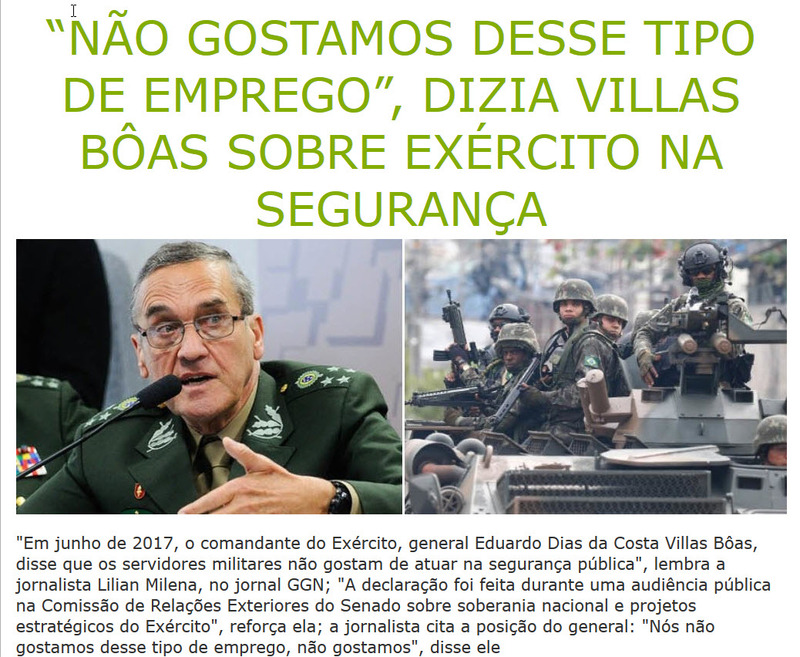 A further example came on 28 February, when General Villas Bôas called for a change in the terms of engagement that would allow soldiers to fire at a person carrying a weapon in the streets of Rio, rather than firing in the air, as present rules require. The general was speaking at the farewell ceremony for General Antonio Hamilton Mourão, the head of the army’s financial secretariat. In a speech at the ceremony, General Mourão praised as a ‘hero’ Colonel Carlos Brilhante Ustra, his former commander. Ustra was head of the II Army’s Intelligence Unit, DOI-CODI, during the military dictatorship, and was accused of numerous crimes by the Truth Commission, including the torture of former president Dilma Rousseff, when she was a left-wing guerrilla. As if to emphasise military control, it was announced on 27 February that General Braga Netto had appointed General Richard Nunes as Security Secretary for the state of Rio, and his team is vetting names to head the civil and military police. General Nunes commanded the army operation in the Mare favela between December 2014 and February 2015. While Brazilian TV is largely presenting these changes as a technical matter, especially since existing Law and Order Guarantee legislation has allowed the military to operate in Rio, security specialists and favela communities have expressed alarm at the measure. Three young men from the favelas have produced a video guide to surviving the intervention, which they posted on Facebook. The advice is addressed particularly to young black men: ‘If you’re black, pay careful attention to this.’ The advice brilliantly portrays the suspicion the inhabitants of the favelas suffer from. 1. Avoid staying out late. Unfortunately, in other people’s view, if you’re out at night you’re not only black, but a criminal who might be dangerous. 2. Don’t go out without your ID. Make sure you carry your identity card or your employment card in your pocket or your back pack. 3. Tell your friends where you’re going. Let people know on Facebook, or Whatsapp, where they can find you. 4. Never go out without your cell phone with the battery charged. You can use this not just to make calls but also to make recordings and share your location. And if you’re carrying something expensive, like a cell phone or camera, have the receipt with you. 5. If you’re stopped in a public place, make a recording: who stopped, where they stopped, how they stopped you. If there are victims, film them. Film witnesses. 6. If you’re moving about, don’t carry drills or long umbrellas. It seems stupid, but from a distance they can be mistaken for firearms. Carry an umbrella that you can fold up and put in a bag. 7. If you’re stopped by army officers, don’t make abrupt movements and don’t be aggressive to them. If you want to get something out of a bag, ask for permission. 8. If you’re driving and are ordered to stop, don’t accelerate. Stop the car and put your hands on the steering wheel. Make sure you have the vehicle documents. The Federation of Favela Associations of Rio de Janeiro is a non-profit organisation founded in 1963 to fight against the removals initiated by the Lacerda government and the implantation of the military dictatorship in Brazil in 1964. We are in a position to warn that this new military intervention did not start yesterday. Previously we’ve had the UPPs [Police Pacification Units], the operations under the Law and Order Guarantee, and the amendment that transferred to military courts jurisdiction over abuses committed by members of the armed forces during their interventions. These same interventionist forces were recently in peace missions in Haiti and the Maré favela, where we find that many of their actions were characterised by human rights violations. In this process, it is worth emphasizing, the investment in militarization exceeded the investment in social policies. The occupation of the Maré cost R$1.7 per day and lasted 14 months, involving 2,500 soldiers, war tanks, helicopters and other vehicles without producing effective results either for the communities or for the country. In contrast, in the last six years only R$300 million was invested in policies aimed at social development. Despite this volume of investment in the military intervention in the Maré, we can see that this operation was totally inefficient, since the criminal factions there are still fighting for the control of the region, oppressing the workers who live there. What the favelas really need is a social intervention, which could even include the armed forces. We need schools and nurseries, hospitals, projects for creating employment and income and social policies aimed principally at young people. We need an intervention that brings life and not death. The army is a force trained to kill and act in times of war. The favelas have never declared war on anyone. The favelas have never been and never will be a hostile area. We are made up of hard-working men and women who struggle for their daily bread with much vigour and dignity. The occupation of a section of the communities by undesirables takes place precisely because of the absence of the state in the form of policies that could ensure the development of our favelas. In the last 54 years FAFERJ has been campaigning for democracy in Rio’s favelas. There the dictatorship has not ended. We still see the police invading homes without warrants, people being arbitrarily arrested or even cases of disappearances, such as that of Amarildo, which became news worldwide. In conclusion, we would like to restate that military interventions are expensive, long and ineffective even in terms of security. We suggest that these troops be deployed to patrol Brazil’s borders because it is a notorious fact that it is across the borders that weapons and drugs come that feed the small-scale drugs trade in the favelas of Rio de Janeiro. We also suggest a large-scale social intervention in Rio de Janeiro’s favelas. We only need a chance to prove that we are the solution that Brazil so greatly needs to develop and become a more just country for all. Favelas are power! Favelas are resistance! The intervention has also been criticised by security specialists, who have pointed out that there are nine other states in Brazil that have more murders per head of population than Rio de Janeiro. The choice of Rio is generally seen as media-driven: what happens in Rio reverberates around Brazil and internationally. That the military police commanders in Rio are often corrupt and in the pay of criminals is widely acknowledged, part of the wider picture of corruption in Rio that has seen the previous governor jailed and the state bankrupt. But how putting the military in charge can be a solution, not even Temer has tried to explain. Even the deputy recommending the measure to the chamber of deputies, Laura Carneiro, complained that it had no justification, no strategy and no budget. What has happened in all this region is the intensification of the action of groups such as drug traffickers or militias controlling areas and issues like the robbery of goods, theft of cars, the robbing of people in the streets, and all this is planned. There is no goods robbery, theft of cars or lorries without the approval and, very often, the direct involvement of the police structure. It is present, involved and even organises it. Many cases that have been investigated point to precisely this. Now tell me how a general with troops from the army, who have no ability and no experience of area patrolling, is going to cope. It’s always for this group of white people, a middle-class elite, that this political-media response is designed. This section of society believes in this account that crime is only located in the favelas, which we know is not true. You have the petty stuff in the favelas, but the shark consumers don’t live there, but in the richer districts. So in the poor districts there is fear. These people are terrified because they know they will be the ones most affected. One part of the city knows it won’t be affected at all by these actions… An upper middle class district like Leblon won’t have any collective warrants. Soldiers won’t go into the luxury condos and search all the apartments. No-one will do that. They’ll do it in the favelas. This brings us to the politics of Temer’s decree. Commentators, even in the right-wing media, tend to agree that one reason for it is that it enabled him to postpone a vote on his proposal to reduce pension provision, a key plank of his austerity programme but one for which he had not succeeded in corralling sufficient votes in Congress. It requires an amendment to the constitution, but the constitution cannot be amended while a federal intervention is under way. In May 2010 a man carrying out work on the roof of his house in a favela was shot dead by a policeman who mistook his drill for a gun.